In 1859, William S. Ladd teamed up with San Franciscan Charles E. Tilton to form the Ladd & Tilton Bank. Ladd operated their business in a building at First and Stark and it was the first bank to be established north of Sacramento and west of Salt Lake City. The bank received its first deposit of $50 on June 1, 1859. 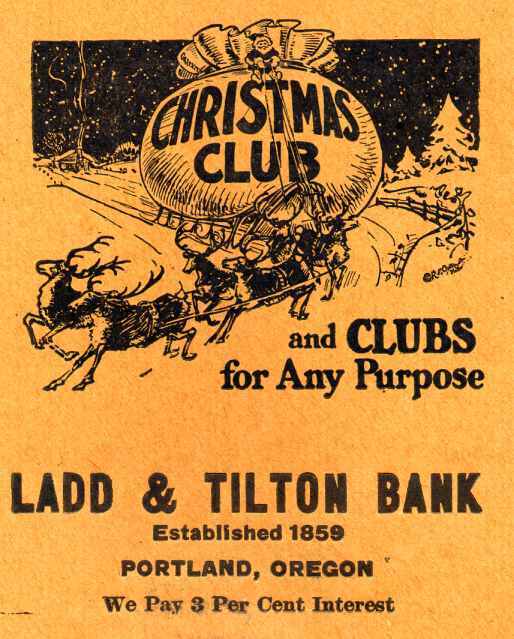 Ladd & Tilton Bank also acted as agent for the Bank of British Columbia until they opened their own branch in Portland in 1867 by a special act of the Court. The Bank of British Columbia later became the Bank of Canadian Commerce in 1912. Later, it was known as the Canadian Imperial Bank of Commerce with four branches in Portland until they were closed in the mid-1980’s. The original partnership between Mr. Ladd and Mr. Tilton was dissolved in 1880 when Tilton retired. Tilton agreed to lend his name to the new partnership between Ladd and his oldest son William M. Ladd. The institution flourished under the name “Ladd & Tilton Bankers”. The elder Ladd passed away on January 6, 1893 and the banking business which he founded continued under the management of his oldest son. 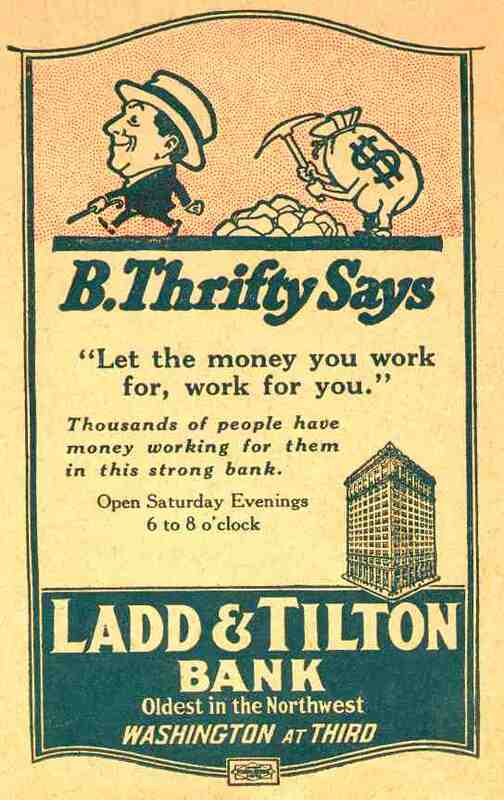 On May 8, 1908, the bank was chartered as a state institution and the name changed to “Ladd & Tilton Bank”. 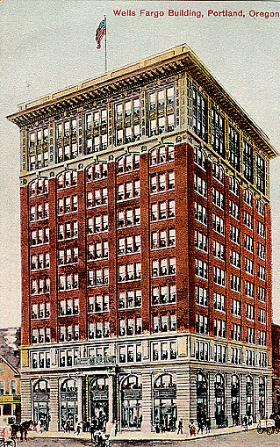 Having outgrown their original building, they moved to the Spalding Building at Third & Washington on January 1, 1911. 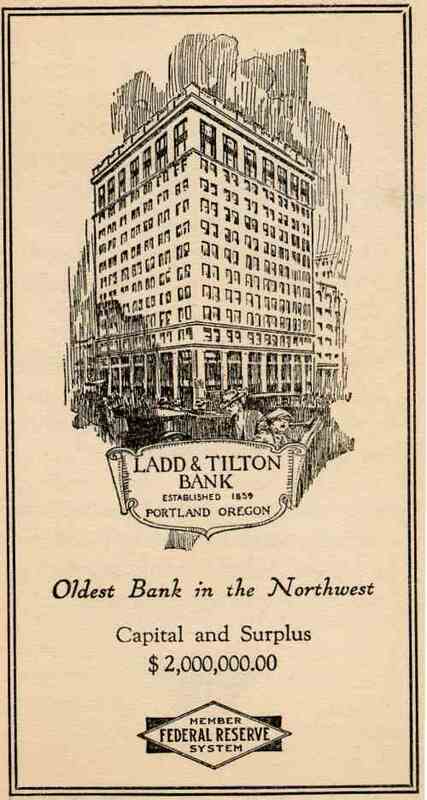 When the United States National Bank purchased the Ladd & Tilton Bank on July 11, 1925, that deal joined the oldest bank in the Northwest with Oregon’s largest bank. When the two banks joined, the United States National Bank became the largest bank west of Minneapolis and north of San Francisco. 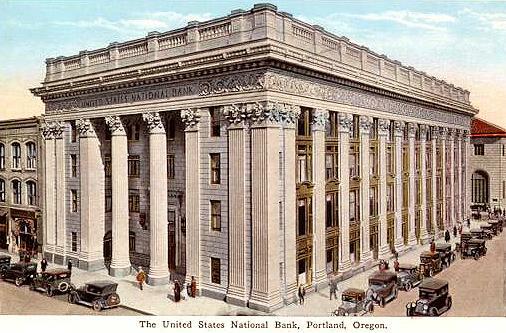 The 13th bank to open in Portland was the United States National Bank which was incorporated on November 10, 1890. 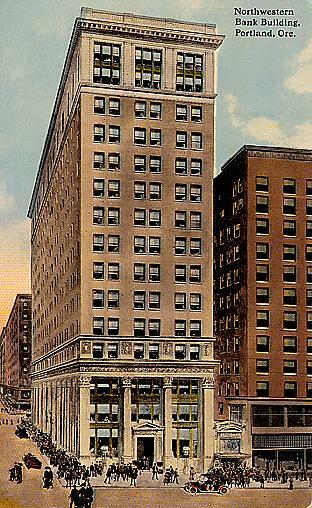 The bank opened for business on February 9, 1891 in the Kamm Building on First Street. Two years later, the panic of 1893 hit many banks and operations were suspended, but the United States National Bank managed to remain open. In 1902, U.S. National merged with the Ainsworth National Bank. 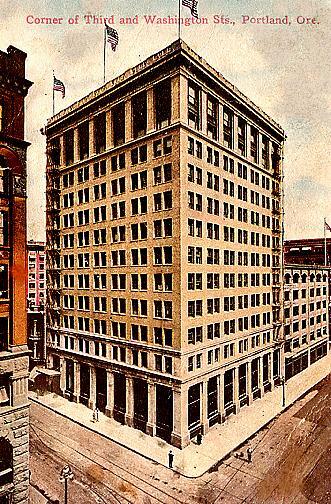 This view of the United States National Bank building shows the building as it looked after completion in 1917 when it was built under the direction of A.E. Doyle, one of the West Coast’s leading architects. To the left is Stark Street and Sixth Avenue is on the right. The building to the rear and to the right was the original Wells Fargo Bank. 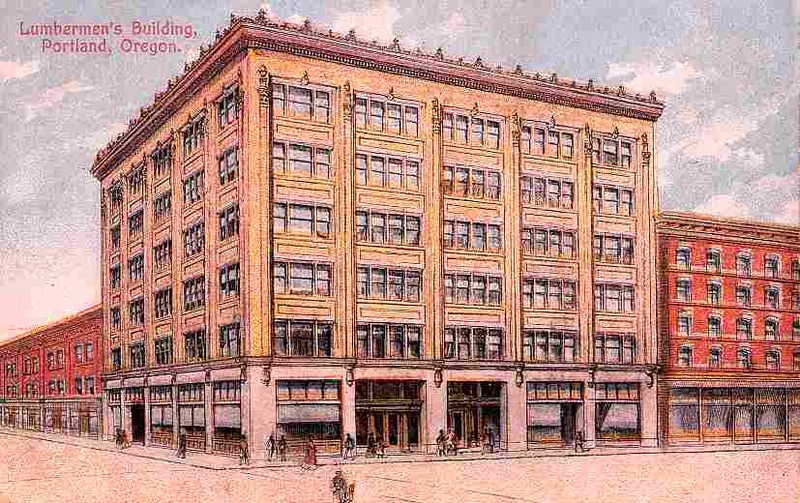 When the steel and terra cotta building, which was designed in a Second Century Roman style, opened for business on July 30, 1917, it was the first edifice in Portland constructed with a steel frame. The free standing columns on the building’s exterior are of Corinthian design with modified capitals, which stand 54 feet high. Marble used in the lobby came from various parts of the world. The white marble in the floor and the columns was imported from Italy. The red marble in the floor came from Hungary and the black marble on the check counters came from Belgium. Today you can see a crack in the floor where the two buildings were joined together. All the light fixtures were originally made in 1917 by Fred Baker especially for U.S. National Bank. He rewired the fixtures in 1975 at the age of 90 so the the fixtures could accommodate larger bulbs for better lighting. He also constructed the lanterns in the hallways to the U-Bank and elevator when the fixtures were rewired. The bronze doors to the lobby were designed by Arvard Fairbanks, a former professor of sculpture at the University of Oregon. He was inspired by the world famous fifteenth century “Gates of Paradise” doors to the Baptistry in Florence, Italy. The bank’s doors on the Broadway side illustrate progress in transportation with scenes of the Lewis & Clark Expedition: oxen pulling wagons westward, Indians frightened by the Iron Horse, Captain Robert Gray’s ship: “Columbia”, fur traders and a waterfront scene. On the Sixth Avenue side, the doors depict international good will: science’s progress through Direction, Labor, Domestic Welfare, Understanding and Expression, Enterprise and Life. Downstairs, the vault door to the Safe Deposit area is constructed of manganese tool steel and it weighs 13 tons (26,000 pounds). Steel for the first 6,600 safe deposit boxes was originally intended for French 75MM cannons, but World War I ended before they were made and the steel was purchased by U.S. National Bank. The vault now holds approximately 11,000 safe deposit boxes. By 1920, the leaders of the bank decided it was time to expand and they purchased the quarter block on the southwest corner of the block from the Elks Lodge. Construction began early in 1924. The same artisans and craftsmen who built the original building were commissioned to duplicate the ornate interior. Later view of building after completion of the second half in 1925. To the right is Stark Street and to the left is Broadway.The facade remains virtually unchanged today. When the expanded building opened in February 1925, it took up the full width of the block along Stark Street. This later view shows the bank as it looked in 1925 when an expansion project duplicated the existing building and doubled it in size, making it one of the largest and most up-to-date banks in the nation. To the right and to the rear, you can see the corner of the original Bank of California Building, along Stark. Architect A.E. 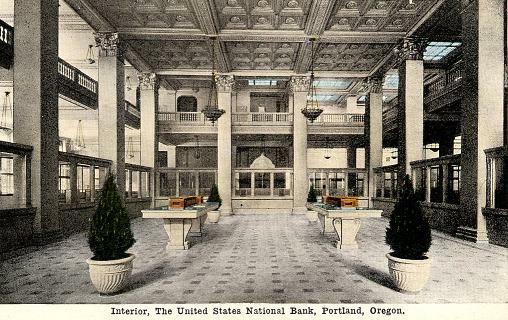 Doyle, who also designed the Meier & Frank Building, the Lipman Wolfe Building, the Central Library and Reed College, was the architect on the U.S. Bank Building. In this interior view, you can see the bank upon completion in 1925 with a lobby ceiling that is 30 feet high. Casts for the ceramic bas-relief on the ceiling were handcarved. Each square was then hand painted under Doyle’s careful supervision and the ceiling has never been repainted. U.S. National led the way nationally in branch banking in 1933, with the opening of a branch in The Dalles, Oregon. In 1956, U.S. National was the first bank west of the Mississippi to have a drive-up teller window. Later that year, U.S. National was the first bank in the world to post customer’s checks electronically at the Sheridan Branch on November 1, 1956. In 1970, U.S. National offered 24-hour banking with the installation of the first automated teller machines in Oregon. At it’s peak, U.S. National had over 200 branches in Oregon. Long gone are the days when you would see hundreds of customers waiting in the long lines at the Main Branch to cash their paychecks on a Friday afternoon before a holiday weekend. In the mid-1990's, U.S. Bank was bought out by First Bank of Minneapolis which later merged with First Star, and the U.S. Bank name was retained for all of their locations. This blotter, which was mailed to customers in their monthly statement, is very supportive of the war efforts against Germany in World War I. Wells Fargo and Company played a very important role in the development of Portland and the West. Beginning in 1852, Henry Wells and William Fargo contracted with local stagecoach companies to carry passengers, mail and gold throughout the West. They opened an office in Portland the same year, which was the hub of Wells Fargo’s banking and express business in the Northwest. The coaches also traveled from St. Louis to San Francisco via El Paso and Los Angeles. In its heyday, Wells Fargo boasted a line of 1500 horses and 150 Concord Coaches. In 1867, Wells Fargo owned more than 3100 miles of overland stage lines. 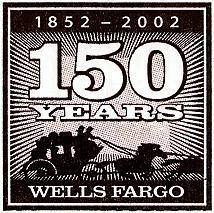 In the 1890’s, Wells Fargo operated 105 offices in the state of Oregon. The Abbot-Downing Company of Concord, New Hampshire built this Concord Coach for Wells Fargo in 1853 and it is a veteran of the Overland Trail. This stagecoach is on display at the Wells Fargo Museum in the San Francisco Building on Treasure Island at the site of the Golden Gate International Exposition. Other coaches can be found in Los Angeles, Sacramento and San Diego. 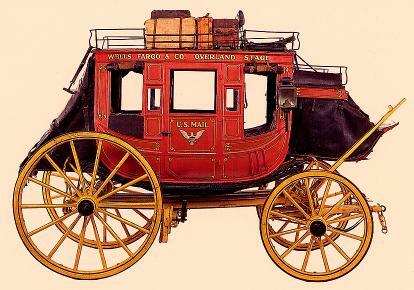 Today, Wells Fargo Bank has 10 Historic 19th Century Concord Coaches that have become the symbol of the company. There are a similar number of authentic replica coaches that are used for parades and other civic events. Millions of people see the Wells Fargo Coaches every year. A replica of the original Coaches is on display in Portland at the Wells Fargo Museum. Well’s Fargo purchased control of the Commercial National Bank, which opened on January 24, 1896, during the panic of 1893. It was closed for several months, but reopened and remained the Commercial National Bank until 1898 when it was renamed, becoming known as the Portland Branch of Wells Fargo and Company Bank. 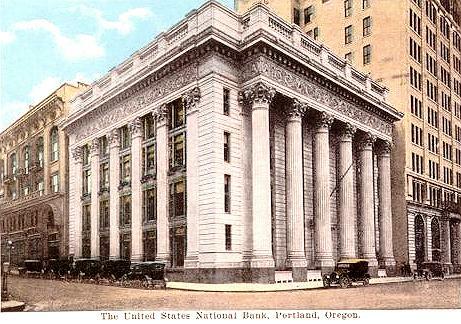 On June 5, 1905, the United States National Bank purchased the banking assets and assumed the deposit liabilities of the Portland Branch of Wells Fargo and Company Bank. The Wells Fargo Express Building, at SW Sixth and Oak Streets, which opened in 1907, was owned and used by U.S. National Bank for many years. If you get a chance to view the Wells Fargo building today, you will still see the large letters spelling WELLS FARGO near the top. The building is being renovated and leased for small startup businesses. 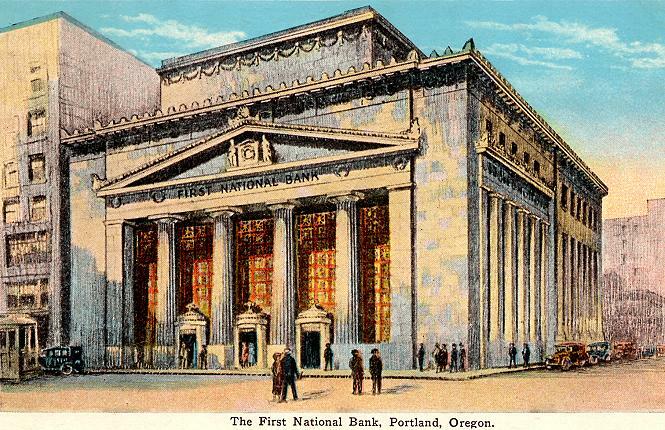 The First National Bank of Portland was born during the 1865 Fourth of July Celebration in Portland when five prominent business men gathered at attorney Armory Holbrook’s office to draw up “Articles of Association” for the First National Bank on the Pacific Coast. 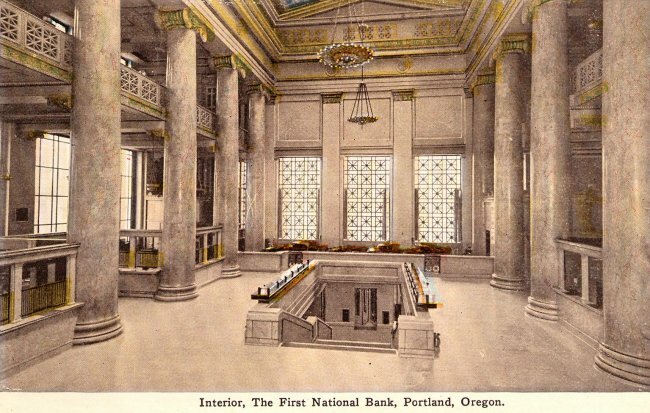 They petitioned the Comptroller of Currency in the nations’s capital to name the bank “First National Bank of Oregon”, but the Comptroller returned the charter papers with the name “First National Bank of Portland”. The partners accepted the name and it remained for many years. The bank opened its doors for the first time on May 7, 1866, before a national standard of exchange had been established. When the panic of 1873 struck, First National Bank helped local merchants and farmers survive the panic and even paid a 12 percent dividend to stockholders. First National Bank solidly withstood other panics as well as the severe test of the Great Depression and never closed its doors on its loyal customers. Built in 1916, the First National Bank Building resembles a Greek Temple. It was designed by W.A. Coolidge an alumnus of Harvard. In 1979, First National merged with several other banks to become the multi-state First Interstate Bank of Oregon. 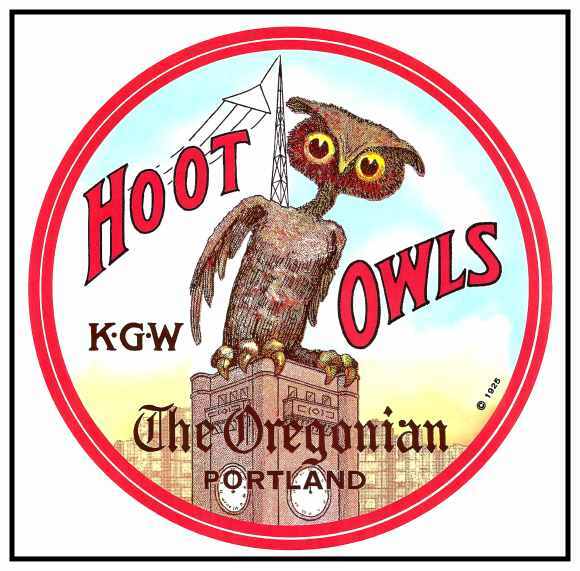 They had a larger penetration of the customer base in Oregon than in any other Northwest state and Portland became the Regional Headquarters for First Interstate with nearly 200 branches in Oregon. Wells Fargo Bank returned to Oregon in 1996 when they bought First Interstate. Wells Fargo also merged with Norwest and soon thereafter Wells Fargo became a leader in Mortgage Lending. The Northwestern Bank Building at 6th & Morrison was built in 1913 and opened in 1914 with distinctive granite-based Corinthian columns designed by A.E. Doyle that make up the facade. It now serves as a Wells Fargo Branch. Local founding fathers Henry Pittock and Frederick Leadbetter organized the Northwestern National Bank Company in 1912. The bank first opened its doors on January 2, 1913. Several years later, it was the third largest banking institution in Portland. Pittock was the president of the bank until his death in 1919. Tragedy struck in late March in 1927. Rumors that the bank was unstable began circulating on Saturday March 26. The bank’s customers began receiving anonymous calls warning them that the bank was about to fail and to withdraw their funds immediately. On Monday, March 28, lines began forming before the bank opened. Crowds of depositor’s fought to get into the bank after it opened. Closing time was extended from 3 pm to 6 pm and over two million dollars in deposits was withdrawn. When the bank closed at 6:00, things appeared so hopeless that the bank decided to go into liquidation. The next day, the bank’s directors worked out a plan under the direction of the local bank clearinghouse and a national bank examiner whereby the Pittock estate and other stockholders would provide a guaranty fund to assure that all depositors would be paid. Depositors were not given cash, but they were given a check to be drawn on or deposited to their choice of either the United States National Bank or the First National Bank of Portland. Northwestern National bank’s customers numbered in the tens of thousands and the pay out took many weeks. 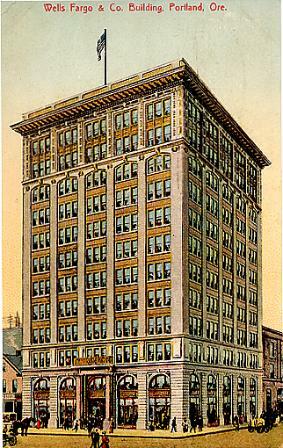 The Spalding Building at Third and Washington opened on January 1, 1911 and it housed the Ladd & Tilton Bank for a short time. Later it became the Portland Trust and Savings Bank, which later became The Oregon Bank. The Portland Trust and Savings Bank was organized as the Portland Trust Company of Oregon on April 22, 1887 and Henry Pittock was vice president. In 1910, Pittock acquired control of the bank. When he organized the Northwestern National Bank in 1912, Pittock wanted to separate the commercial banking business from the the Portland Trust Bank’s trust business. The Commercial Bank of Lake Oswego merged with the Portland Trust and Savings Bank in the 1960’s and they became The Oregon Bank. 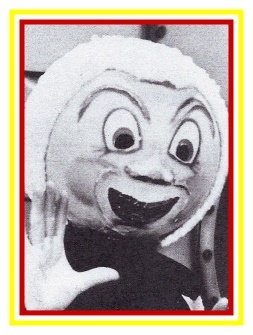 In the 1970’s they merged with Security Bank of Oregon and had about 35 branches scattered around the State. Rapid growth near the latter ‘70s increased their branch count to nearly 50 branches. Security Pacific Bank bought The Oregon Bank in 1987, and Bank of America bought Security Pacific in 1992. The old main branch (in the Spalding Building) was closed and sold when Security Pacific bought Oregon Bank, several years after Orbanco built a new headquarters building. The Lumbermans National Bank was organized April 6, 1906 as Bankers and Lumbermans Bank. In April 1908, the name was changed to the Lumbermans National Bank. A year later, the bank moved to the Lumbermans Building at the northwest corner of Fifth and Stark streets. In 1913, Lumbermans Bank bought the West Side Branch of the Geo. W. Bates & Co. Bank which was located in the Henry Building at Fourth and Oaks streets. United States National merged with the Lumbermans National Bank when it was acquired on September 15, 1917.